I'm there. 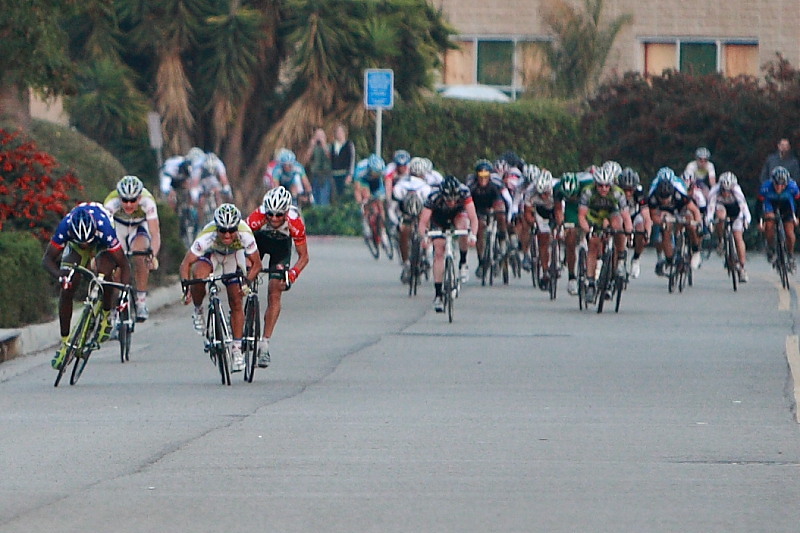 Look for a really tall guy in UCSD kit in cat 5. Say hello. I wanted to go, but I gotta save the legs for CBR on Sunday; I got teammates to look after. Hopefully next year! UCSD kit in Collegiate D's. Boulevard looks like wet roads and probably some light rain though. Hopefully the D field is small so we don't all go kill ourselves coming around a corner. Boulevard is already over for the 4's. They gave PAA's Reutimann the trophy when he signed up. I'll be doing C's if I can get a ride down there. And Ryon! Why are you going to be wearing UCSD's kit?! You guys better hope he flats or you're not kidding. Wes is a beast!!!!!! I love these races I wish I could have flown out there for the weekend! if he us so strong, why still a 4? Just got through his 10 races last season (his first season racing road) and this is his first 4's race. Don't worry he'll be stomping the cr#p out of the 3's soon enough. Reminds me of English last year. What does he look like so I know who to watch out for? Also, any recommendations for places to stay Saturday night for Red Trolley? La Jolla/University City if you want to spend some $$, The Marriott in Carmel Valley is nice, or somewhere in Mira Mesa/Miramar for cheaper options. edit: it might be hard to find anything in La Jolla because of the Buick Classic. Damn Golfers. Trying to save $ on travel this year, found "Homestead San Diego-Sorrento" on Priceline, I'll probably just take that unless there is something else nearby. I'd like something close enough I can just ride to the race. I was crushed when I saw his name show up the on the Reg list. I don't think he has it in the bag yet. We've got a guy from our morning rides that will give Wes a good battle. He's not on a team, but I think he's won everything he's done. The guy posted the fastest time at the last Fontucky XC Mtn bike race, faster than all the pro's! Well at least I know who to watch, sadly though, I'll probably be watching them ride up the road. I'm in, rain, snow or shine. Steve...don't let them get into your head. They still gotta run the races. I know of a LOT of uber-strong guys who don't end up with fairly good road results. I'm glad he doesn't do crits. I had to witness the carnage in road races last year as a 4. He's part of the reason I won't even do them as a 3. Why even bother The only difference is that there will be more guys dropping me on the climbs. I credit Wes for helping me realize that my territory stretches no farther than business parks and downtown courses when it comes to racing. Someone faster than Wes in a road race? Crikey, that's going to be a miserable day for a lot of folks who try to hang on. That would be an interesting battle to see, two mountain bikers destroying a roadie field. From what I remember, it was one of umd's teammates(Seth?) who beat him at Punchbowl last year. That was pretty surprising. From what I remember, it was one of umd's teammates(Seth?) who beat him at Punchbowl last year. That was pretty surprising. Yup...he's a 2 now...and pulled off a respectable 20th in his first P/1/2 road race up in Los Olivos. Oh don't worry, I'm not letting them get to me. It was more a nod to the guys elsewhere that ask how guys with good power thresholds are still in cat 4. It's because there are so many of us! It's not that cali guys are faster than other parts of the country it's just that there are so many fricken fast guys in cali. And of course there being more than just power. I left a lot on the table in last week's race. I was very disasspointed that I didn't maybe attack more, especially after I made it up the hill in with in a small group with a big gap to the field. That would have been perfect but I played it "safe" and went the group pace. Looking at my data from the race I only had an IF of .8. I do my SST rides harder than that! Of course it didn't help that I was stuck too far back all the way out to the turnaround... should have attacked some on the way back to the hill if for no other reason than to break things up a little more. Yeah, he and Chester are both go-getters. Always creating breaks or going with them. Just mark your men. Look at the entry list, remember their #'s and get to the bottom of the climb with them. That's all anyone can really ask for. At that point it's all just a matter of talent/not enough talent/no talent, anyway. For me on that course it's a matter of no talent.